FL@33's first set of stationery from September 2001 was a true low-budget solution. 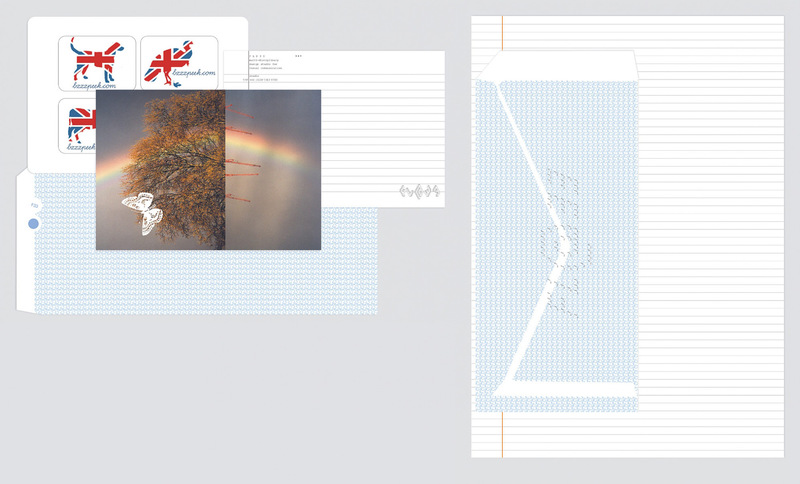 ___ As a letterhead we used pre-printed, lined standard paper (the ones with grey horizontal lines and one orange vertical line on the left). Invoices were white, reminders yellow. ___ We used standard DL-sized envelopes that we carefully took apart to turn them inside out and painstakingly glue them back together again – now with the envelope pattern outside. ___ Then we printed the FL@33's ASCII logo on the envelopes using the studio's laser printer. ___ The FL@33 postcards Envelope Pattern (#2) and Cityscape Metamorphosis (#3) later completed the stationery in June 2002 – as they were designed to be cut to business card size whenever necessary.